Over the past four centuries, volcanoes have killed more than a quarter million people. Most victims perished in a handful of epic disasters and were killed not by searing lava but rather by secondary causes in the wake of an eruption—mudflows, tsunamis, and starvation. As the following history shows, saving lives in the future will require not just scientific forecasts but also the resources to evacuate those in danger. Explore some of the worst volcanic disasters of the past 400 years—from Indonesia's Krakatau to Iceland's Laki. This feature originally appeared on the site for the NOVA program Volcano Under the City. Â© Greg Harlin: Wood, Ronsaville, Harlin Inc.
See how the tsunami of 2004 developed, from its birth at the seafloor to its impact on coasts around the Indian Ocean. What is "global dimming" and how can it counter global warming? See how this critical phenomenon was discovered. 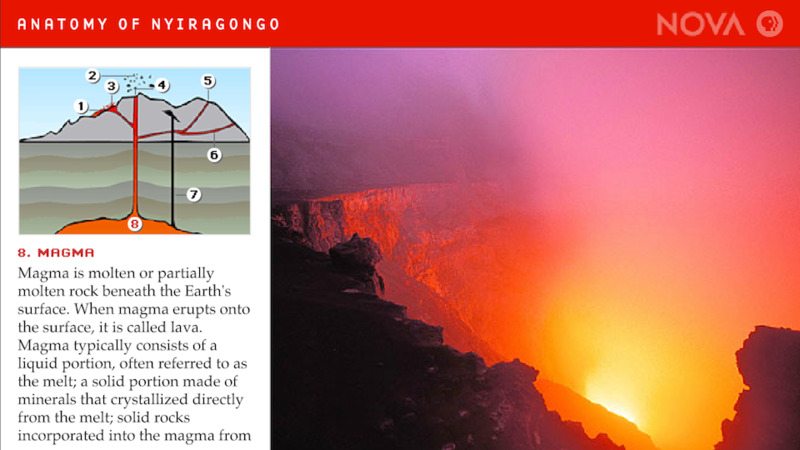 Explore the main features of the Nyiragongo volcano, located in the Democratic Republic of Congo.